Bridgeforce Law, P.C. and Bridgeforce Inc. review the recent CFPB Arbitration Study focused on mandatory arbitration provisions in consumer contracts and provide highlights and required next steps for the financial industry. Bridgeforce Law, P.C. and Bridgeforce Inc. respond to the CFPB’s Arbitration Study, released March 10, 2015. The study was conducted as required by Section 1028 of the Dodd-Frank Wall Street Reform and Consumer Protection Act. The CFPB explained that prior to this study, most of the empirical work related to arbitration was not concentrated on consumer finances. Therefore, this study focused on mandatory arbitration provisions found in various consumer financial contracts for credit cards, prepaid credit cards, storefront payday loans, checking accounts, private student loans, and mobile wireless contracts. Typically, these provisions waive consumers’ ability from bringing class-action lawsuits against companies, and instead permit consumers to resolve their complaints through arbitration. The CFPB’s director, Richard Cordray, stated that “these arbitration clauses restrict consumer relief in disputes with financial companies by limiting class actions that provide millions of dollars in redress each year.” The study determined that, in approximately 67% of the disputes, companies have used arbitration to protect against class action lawsuits. According to the study, nearly 75% of consumers surveyed by the CFPB were unaware whether the contracts they signed included an arbitration clause. Of the consumers surveyed, fewer than 7% actually understood that an arbitration clause would preclude them from suing the company. The CFPB also claimed that the study proved that there is no strong evidence that supports the proposition that arbitration saves consumers money. Per the CFPB’s study, there was a significant difference in consumers’ monetary relief under arbitration versus class action lawsuits. Of the 1,060 financial product arbitrations filed in 2010 and 2011, consumers received $365,000 in damages from the companies, while the companies received $2.8 million from consumers. Conversely, in the last five years, approximately 160 million consumers have been awarded nearly $2.7 billion in damages resulting from class actions. “On a tactical level, the CFPB study will cause financial institutions to revisit their consumer finance contracts,” predicts J. Kurtis Kline, managing partner of Bridgeforce Law. Commentators speculate that there are a number of options the CFPB could undertake if and when it enacts new rules related to the mandatory arbitration provisions. For example, the CFPB could choose to prohibit class action waivers which would prevent consumers from waiving away their right to join a class action suit. Further, the CFPB could prohibit arbitration clauses in general. While the CFPB has not yet issued any new rules in this regard, this study clearly signals the CFPB’s intention to focus on this topic. “In the event companies can no longer waive class actions nor stipulate to arbitration, what were previously boilerplate contractual provisions will play a more dominant role, such as jurisdiction and venue. For example, without arbitration, it will become increasingly more important for companies to select a more strategic jurisdiction and venue,” explains Kurt. “The CFPB has clearly set its sight on mandatory arbitration practices. We recommend that clients get in front of this by mirroring the analyses that the CFPB has completed in this study and completing focused risk assessments within this area,” notes Brian Reiss, Bridgeforce President. For more information about the CFPB’s Arbitration Study and its review of arbitration provisions in financial contracts, go to the March 10, 2015 study at the CFPB’s website. Click here to see the study directly. To learn more about the Bridgeforce insights on the study, contact Kurt Kline kkline@bridgeforcelaw.com or Brian Reiss at breiss@bridgeforce.com. 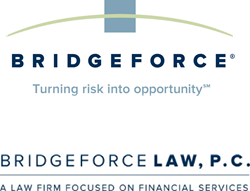 Bridgeforce Law is a boutique law firm focused on financial services, working with a variety of companies with legal and/or operational issues related to consumer and small business lending and payments. Bridgeforce Law works collaboratively with clients to provide legal and practical solutions, and will frequently call upon consultants when real-life operational experience will provide an enhanced client experience and help move business forward.